I managed to get a game in against my boyfriend the other weekend. We don’t get much time for games, so even a little 500 points game is a refreshing change and, equally unusually, I actually won. This isn’t a proper battle report, I didn’t write everything down, more an exploration of my list and my core units, most of which were in action. We played Purge the Alien with Hammer and Anvil deployment on a 4×4 board. Actually, we rolled Vanguard Strike yet again but I know from experience that it doesn’t work so well on a 4×4 as the deployment zone is too small. I won the roll off and decided to go first. I decided to play aggressively with my Swiftclaws and drove them towards the Boyz squad with the Warboss while the Grey Hunters shuffled forward six inches. I really wanted to get the Deffkoptas off the board, so I set my Long Fangs on them while the other squads shot at the Boyz. I’m not particularly tactical, I usually forget something important or place a unit in a daft place. For once I lucked out with the placement though. 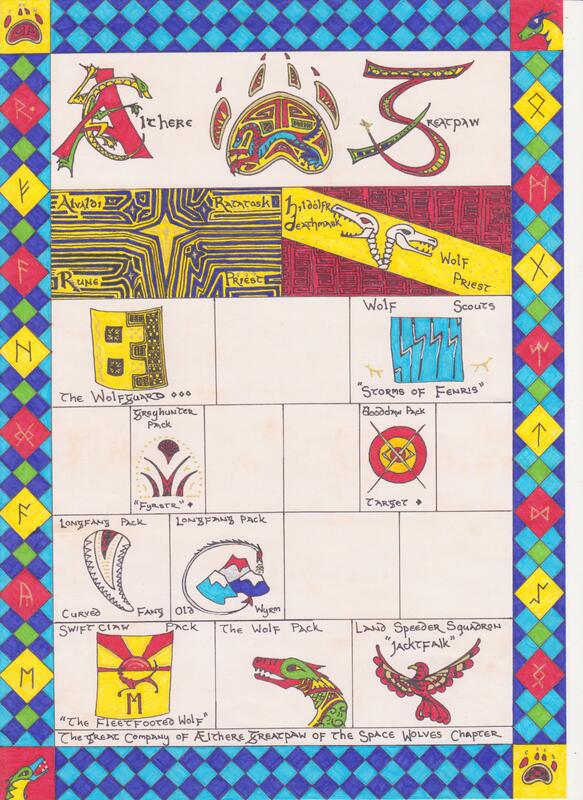 Playing on a 4×4 meant that my Long Fangs could hit everything and my Grey Hunters could hit something every turn. I was also fairly lucky, or rather my boyfriend was very unlucky, as I was able to kill his Warboss in a challenge before he could hit back. If he’d had better luck with his saving throws, I’d have been in a lot of trouble! The mixture of missile launchers and heavy bolters worked fairly well for my Long Fangs against an infantry based army mostly due to the rate of fire. 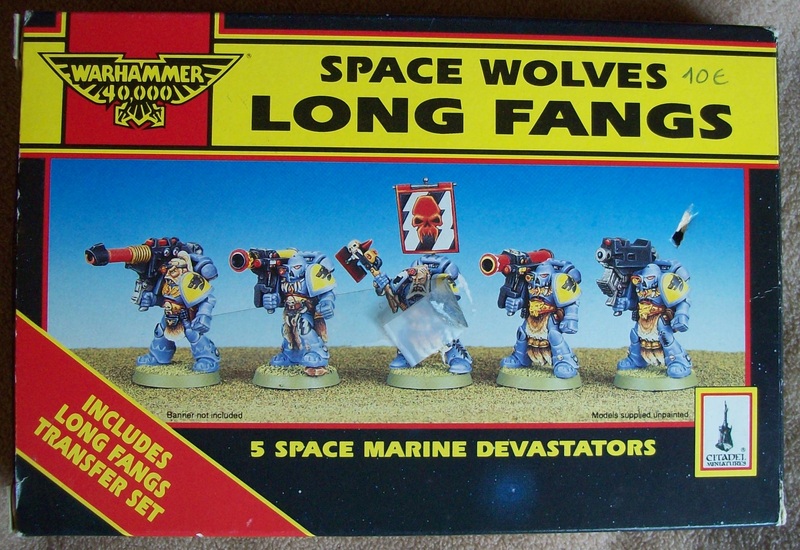 I guess that Long Fangs are probably a little bit too powerful for 500 points, as they are fairly cheap for the amount of damage that they can do, however I don’t think that they were crucial this game. 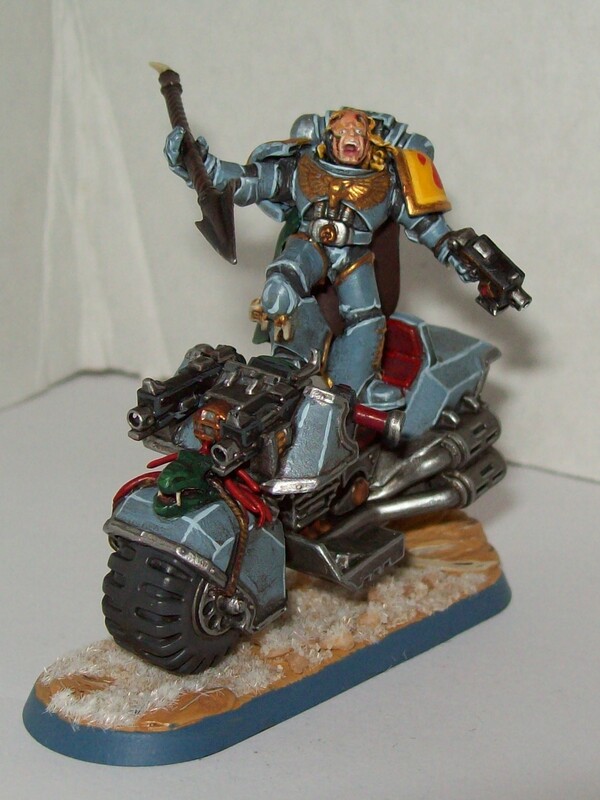 Oddly enough, although Swiftclaws are not the best value for their points cost for Space Wolves, I like them as they do provide a way of getting an assaulty unit across the board very fast and the extra point of toughness comes in very handy. 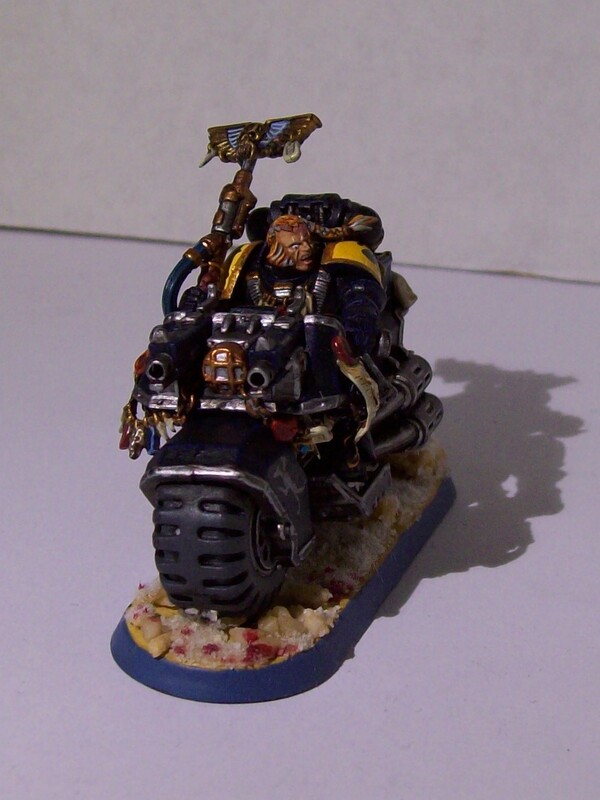 Of course, as Blood Claws, they are only WS and BS 3, but they get an extra attack on the charge and with the very killy Wolf Priest attached to the unit to nullify the Headstrong rule, they are fairly reliable. 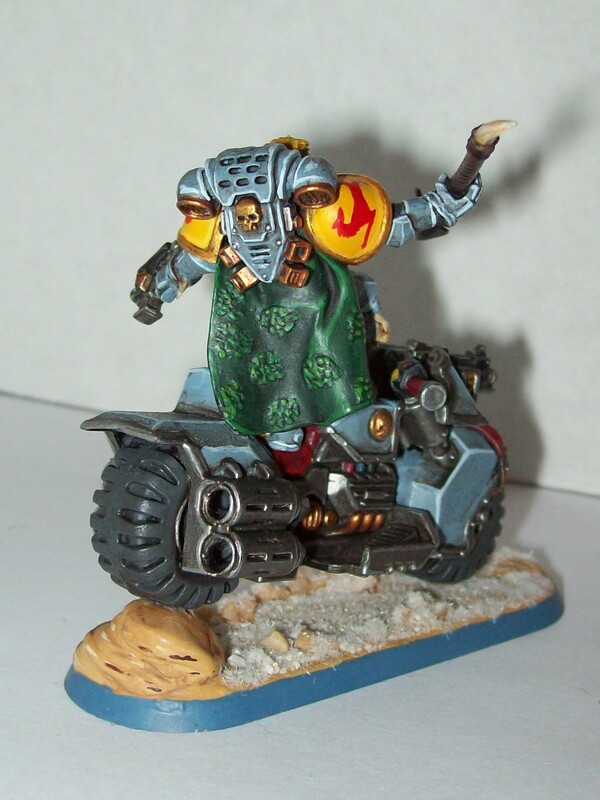 I need to build and paint another one or two models for larger games, but at 500 points, four bikes are fine. I don’t expect them to last the game, just cause as much chaos as possible before they get killed. They were definitely worth their points this game as they killed a 130 point unit of Ork Boyz and one Swift Claw survived long enough to join the Wolf Priest in an assault on the other Ork Boyz squad along with one of my Grey Hunter squads. The Wolf Priest survived this game and I guess he caused the final blow to the Orks as the last unit fell to his sweeping advance in turn three. I lost one pack of Grey Hunters in addition to the Swift Claws. However, they played their part, lasting a turn and a bit in close combat with the second squad of Ork Boyz. I think that if I were to tweak this list a little, I might swap out a Melta for a Flamer in future. The Melta guns did practically nothing all game, and if anything, I was penalised by being out of range with them for most of the game. A flamer is still only short range, but it’s a template weapon (meaning that if I’m lucky I can take out more than one guy with one shot) and might be a bit of fun. It’s a pity that the game only lasted three turns, my boyfriend had some atrocious luck at times, but I think that I’m happy with this list as the core of my army. I didn’t use the Rune Priest as I thought that the Long Fangs would be more useful. In a larger game I’d add in the Rune Priest as a matter of course. Hopefully I can get a few more 500 points games in and try and see if practice speeds up my playing. A 500 point session is never going to be the most epic of 40K games, but that doesn’t mean that it can’t be great fun and it has the advantage of being small and fast, meaning that in my hectic household, there’s a chance of getting a game in! Hopefully I can get another one in soon as my boyfriend needs his revenge and there are a couple of tweaks that we both want to try. Rune Priests, Swiftclaws and Filthy Xenos! My boyfriend and I were in the UK last week and as we had a nice free day at the right end of the right country we made a trip to visit The Overlords again. My boyfriend and I teamed up so we had 750 points of his Orks and 750 points of my Space Wolves facing 1500 points of Eldar. It was an awesome game (which we lost) and I really enjoyed it (thanks very much again). However, as a battle report requires more details than I can remember (like what was in the other two armies), I’m afraid I’m going to gloss over the game and skip straight to what I’ve learned. 1) Eldar are interesting. I have to admit that Eldar never really interested me before. I don’t know why, but I’ve never really looked at them closely. After Sunday I think that I might take a bit more interest, I might even (ok, will) buy the codex some day. I liked the look of the models and I liked the way they played and I’m even coming up with paint schemes in my head. 2) My setting up is atrocious! I really need to think more about how I set up as I’m making stupid mistakes. For instance, my Long Fangs were out of range for large chunks of the game. I had five Grey Hunters plonked on the Objective and five Long Fangs on top of the building where it was hidden. Unfortunately we were playing The Emperor’s Will with Vanguard Strike and the objectives were in the far corners and, as the Orks and the Wolves stormed over towards the other objective, most of the action was on the other side of the board. I also set up my Swiftclaws slightly incorrectly. There was a river on the board that counted as Difficult Terrain, and, rather than going round it, I decided to take the short route, which led to one of my Swiftclaws being swept away while my Wolf Priest took a wound. It would have been a lot better if I had taken the slightly longer, safer, route. 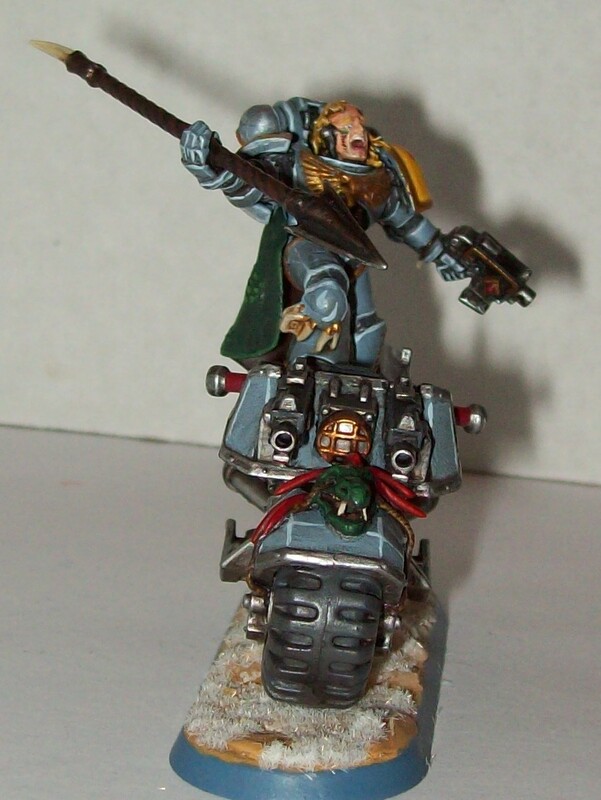 3) The core of my army are my Rune Priest, Wolf Priest and Swiftclaws. My Rune Priest really came into his own this game. I gave him his usual combination of Living Lightning (which I didn’t get round to using) and Tempest’s Wrath, which turned out to be very useful against Mech Eldar. The Runic Weapon that he carries is also very handy when facing enemy Psykers. Although the Swiftclaws die fairly quickly, that’s almost their job. I use them to get to the enemy and distract them so that I can get my other guys forward. 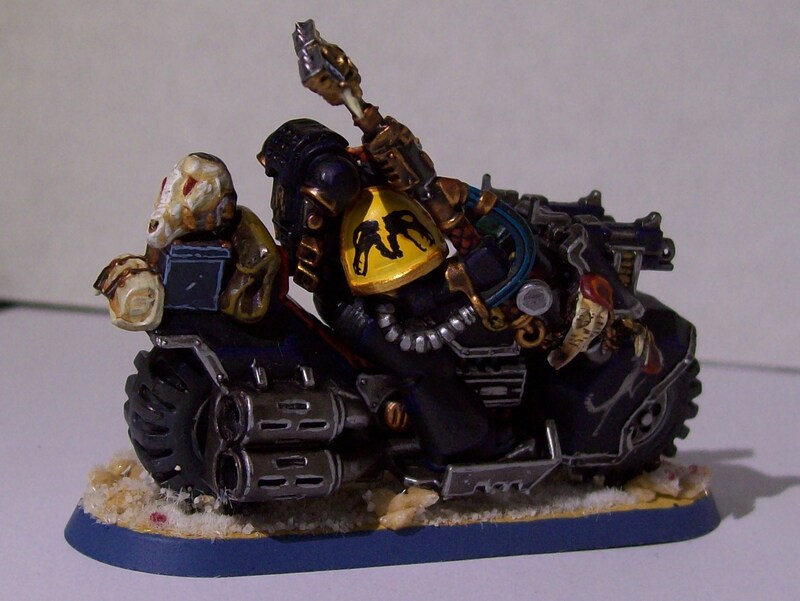 The Wolf Priest on bike is far more survivable (so long as you don’t roll 1s when crossing Difficult Terrain) and, though I wish I’d given him Melta bombs, does his fair share of damage. He’s really good fun to play too. Anyway, despite losing badly, I actually finished a game, had a lot of fun and was happy with my list. I guess that the main thing that I need now is practice! Olaf Fafnirsbane: painted and based. I posted about this guy a month or so back but now he’s finished (well he lost a pauldron so he’s not finished any more, but he was). I took some hobbying things home for Christmas and I ended up painting in bed while I had the flu with occasional help from the dog and the cat. I say help, but there was the terrifying moment when the cat tried to climb on the folding table that I was using for a painting table. I’ve even fielded him in a game where he gained another name “Lord Precarious”. I explained how I built him in the previous post. I painted him in my usual manner: base/layer, wash and then highlights. On his face I decided to add a couple of tattoos to stop him looking quite so much like a surfer as he did at certain points in the painting. So there you go, it’s a short post, but there isn’t much to say. Oh, and in that game… he got toasted by Flamers very quickly! I mentioned a little while back that I’d been away on a trip. During the long flight back I had an idea for a conversion. I got back home and spent a good part of the rest of the day sitting in a pile of sprues looking for bits. However, it’s taken me until now (well, Saturday) to find and convert everything. 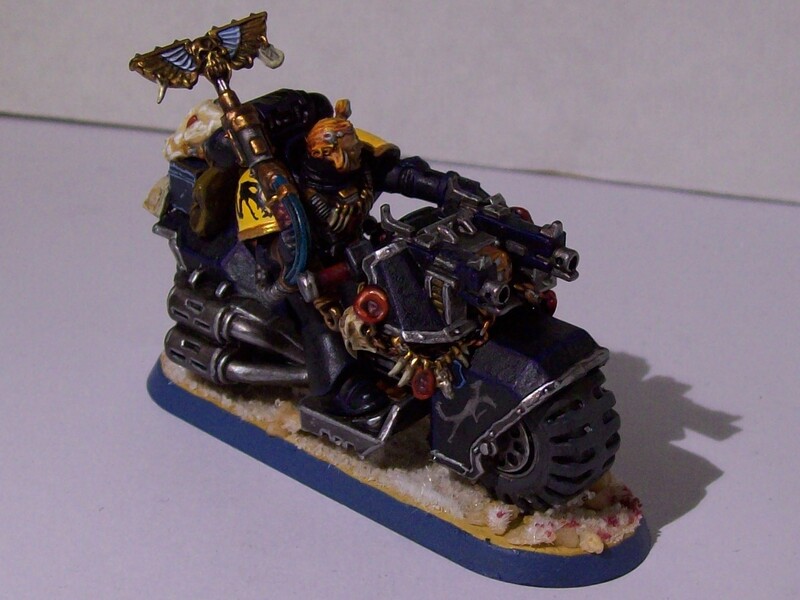 I wanted to build a Swiftclaw harpoonist, standing on his bike, and, as the harpoon is a marine weapon, I decided to give him watery rather than furry trophies. 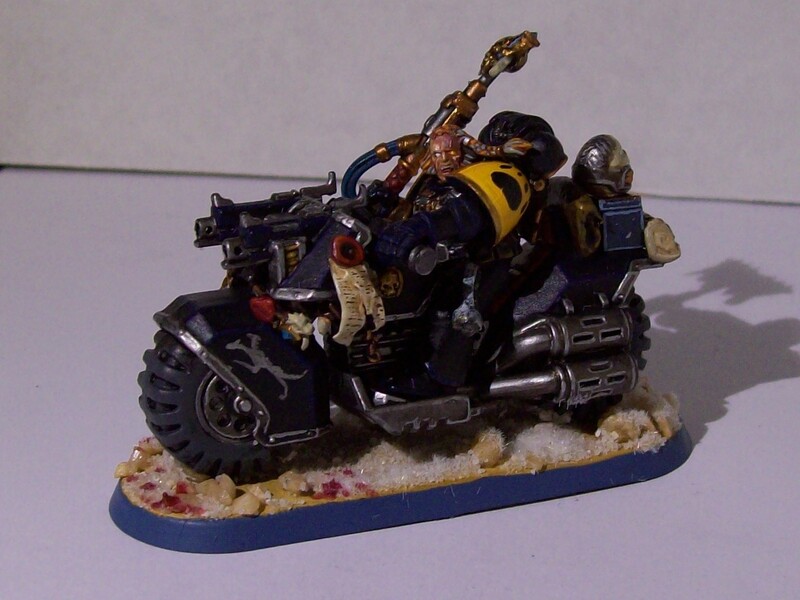 The biker himself is built from parts from the Space Wolves Pack, Space Wolves upgrade and Space Marine Bike kits. I reposed him by carefully cutting along the joints using both a scalpel and a razor saw, drilling a hole through the pieces and threading steel wire through them to make them poseable. I then repaired the joints using greenstuff. The harpoon arm is actually a biker’s arm, as it was easier to deal with than anything with more detail. The harpoon itself is made from the pole of an icon from the Seekers of Slaanesh kit, topped with a speartip made from plasticard and green stuff. The serpent hide cloak is just made from green stuff. 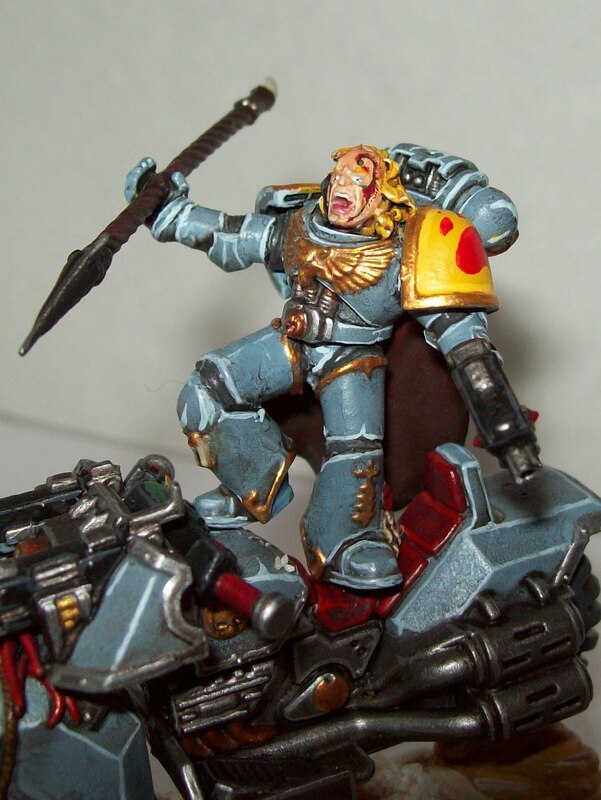 I decided to make a more dynamic head for this model, so I found one from the Space Wolves Pack box which had the right expression and removed the hair. Then, once I had positioned the head, I sculpted hair on. 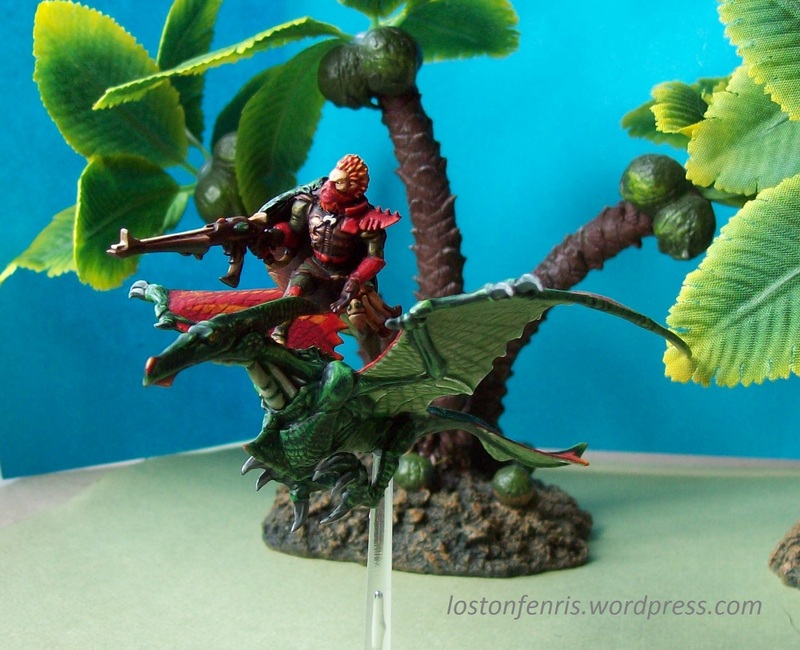 I used green stuff on the bike too, in order to sculpt the sea serpent trophy on the front of the bike. I then magnetised the model so that it would be easier to transport. So, the next job is to paint it. I have to defend my thesis, have a project meeting, find a flipping jacket and keep various relatives under control, all before Christmas (there’s also all the shopping stuff to do). However, I would like to get him done before I go home. My Wolf Priest was my first ever conversion and, to be honest, I’ve never been completely happy with how he looked, so, when I started building my Swiftclaws, I decided that I’d rebuild him as an HQ to go with that unit. 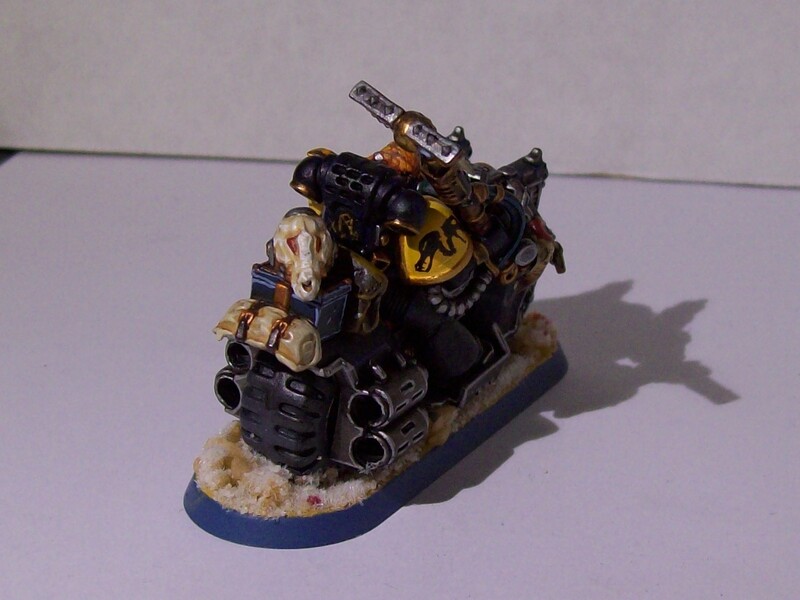 There are bits from the Ravenwing bike kit, the Space Wolves pack and the Space Wolves upgrade frame in there. For markings I decided to go with using Morkai, the two headed wolf of death, due to him being a Wolf Priest, and also due to the scarring on his face. Trying to get the scarring right was quite important for me. This character has quite a complicated back story in my mind. The scarring was caused by a heroic last stand that turned out to be not quite as final as he had assumed. I wanted it to be quite extreme, and I’ve almost got it how I wanted it (I had a little mishap with a wash and his face turned out darker than expected). I’ve already talked about the Wolf Skull Helmet. I really wanted to get that and the Crozius onto the model. I decided that adding an amulet on top would have been too much, but I did manage to fit on a cannister for geneseed (a piece of tubing stopped up with green stuff), strapped onto his belt. Anyway, here you are,meet Hildólfr Deathmask, Wolf Priest of the Great Company of Ælfhere Greatpaw, ready to lead those riotous Swift Claws into battle! I have two more bikes left in the kit to build, but I may leave them for a while as I have a couple of projects (and that flipping Aegis Defence Line) waiting to be done.